The tenor of the heavy comment I receive from Canadian readers indicates that there are large numbers of Canadians who are alarmed by the failure of almost any media outlet in this country to separate reporting from comment, and are offended by its sanctimonious do-right, feel-good, uniformity of perspective. To my pleasant surprise, messages I received after my comments on the native people in this space two weeks ago ran 50 to one in my favour. I take no issue with the remarks of Chief Joe Dion in the National Post on Aug. 14, which purported to be a reply. When someone is accused of being "unhelpful," as I was, that means that the author disagrees but has no grounds for factual refutation. I agree with most of Chief Dion's piece and wish him complete success in all the endeavours he mentioned. I should clarify that the complaint of inadequate consultation in the Ktunaxa case arose from the Constitution, and not the Charter of Rights and Freedoms, as it seemed from my omission of a single word in my final edit. I apologize for the slip. The response to last week's piece about the Korean crisis was also gratifying, and maintained about the same ratio. But I have a ghastly, sinking feeling that Tina J. Park's comments in Maclean's on Aug. 14 are representative of what the Canadian media think: that the problem is that two madmen, Kim Jong-un and Donald Trump, are endangering the world with their mutual and escalating irresponsibility. Park hallucinates. Trump's "fire and fury" comments about a North Korean attack on the U.S. did not have an "eerie doomsday-like tone;" the defence secretary, General Mattis, has not "rushed to downplay Trump's message," he echoed it; and Trump did not "haphazardly" toss off "reckless threats." 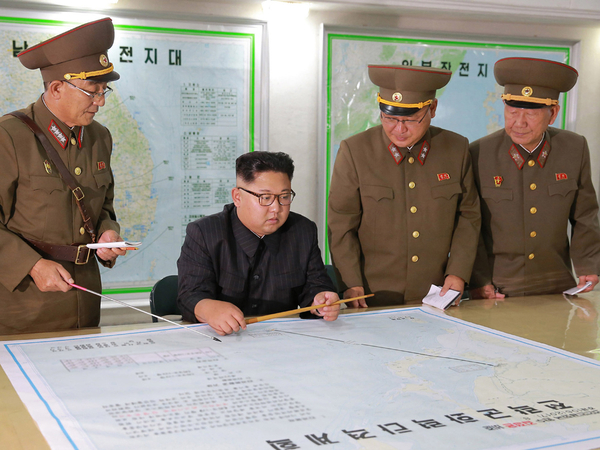 It was all quite clear: if North Korea attacked Guam or an American ally conventionally, the response would be conventional but overwhelming; if North Korea launched a nuclear strike, the response would be nuclear and devastating; and unspecified was whether the response would be military or economic if North Korea doesn't attack, but continues its progress toward an intercontinental deliverable nuclear capability. Though the U.S. president didn't say this, the answer to this question obviously rests with China and whether the People's Republic will join to make economic quarantine effective. There is nothing irrational or flippant about this, and even former Canadian Charles Krauthammer, who is no Trump supporter, thought the "fire and fury" statement appropriate, and "worthy of President Truman." Furthermore, it was successful, as Kim announced mid-week that he would not be firing missiles near Guam after all. Park's portrayal of North Korea as some sort of worthy protagonist of the United States was bunk; it either does not have, or would not retain after one hour of hostilities with the United States, "one of the largest standing armies in the world, advanced nuclear and missile capabilities ... and the latest submarine, cyber, and aircraft capabilities." It has 20 small diesel submarines, a minuscule air force and a grossly under-equipped army. The only military issue is whether the U.S. in a preemptive strike could destroy enough of the artillery massed to bombard Seoul (the booming and immense capital of South Korea), before it could be fired. North Korea is not a formidable adversary, and has a GDP smaller than that of Nova Scotia, and a per capita income of five per cent of that of South Korea. It is a starving, tyrannized basket case that could not withstand or answer an American conventional first strike for 10 minutes. This does not mean that war should be entertained frivolously as a policy, as it habitually is in Kim Jong-un's polemics, and Park rightly points out that Trump has inherited a mess created by the utter lassitude on this subject of his three predecessors (Clinton, George W. Bush and Obama). But her proposal that "Canada could inspire a much-needed fresh approach in tackling the root causes of North Korea's military program" is a mad conjuration. She advises that the "liberal-democratic world can only exist if those who threaten it with violence are constrained by diplomatic measures which encompass respect, political engagement, humanitarian values and strategic capability, and ... Canada has a lot to offer in this regard." The fresh approach that is needed is precisely the one Trump is taking: if North Korea does not stop threatening the liberal-democratic world, it will be strangled economically with China's co-operation, or smashed militarily by the United States. Her recitation of the dispatch of Canadian missionaries to Korea in the 1880s, and of Canada's commendable but minor role in the Korean war (we sent fewer men than the U.S. suffered in combat deaths in that war), and her comments on trade between Canada and South Korea, are all fine, but they have nothing to do with solving this problem. The only realities that will produce an acceptable outcome are the credibly threatened economic and/or military pulverization of North Korea. We are down to traditional power politics where the correlation of forces between the U.S. and North Korea is several thousand to one, and the notion that Canada brings anything to the party is self-serving moonshine. The new president of South Korea, Moon Jae-In, was elected three months ago promising dialogue and said he would not deploy the U.S. THAAD anti-missile defense system; he made a 180-degree turn on that subject after one month's "dialogue" with Kim. Taking up Park's historical analysis, the West should now recognize that the individual who had it right in Korea was Gen. Douglas MacArthur. His insubordination was intolerable, but strategically, he was correct, as were his civilian supporters such as Richard Nixon and John Foster Dulles, and we could have got rid of this horrible Kimist pestilence 65 years ago at less human cost than what was incurred in allowing the war to drag on for two years. A united Korea today would be a G8 powerhouse. My sampling of Canadian press treatment of public affairs last week was rounded out by our hysterical account of the Charlottesville riots. What started as a civic dispute over whether to remove the statue of distinguished Confederate commander Gen. Robert E. Lee was escalated by both sides, though especially the so-called alt-right, into a riot between the neo-Nazis and Ku Klux Klansmen who despise non-whites, and the Antifa protestors who are specialists in smashing up universities, as well as the Black Lives Matter movement, which includes its own share of extremists. Local law enforcement made no serious effort to prevent or constrain the violence, and the government of Virginia handed the national and international media the opportunity to blame Donald Trump for the polarization of America, and to falsely impute to him ambivalence about extremist violence. Most of the Canadian media gleefully parroted this outrage. It is just the latest wheeze of the Never Trumpers; racism, misogyny, Russian collusion, chaos in the White House, and Korean war-mongering all having fizzled. Canada knows that its media is weak, and thoughtful people know that weak media ultimately help produce poor government. It is a serious problem, as it was when my associates and I founded this newspaper.